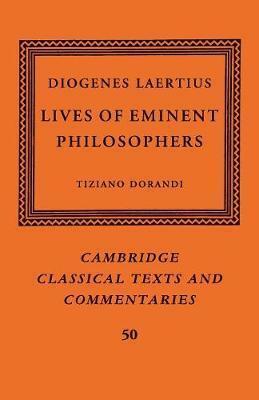 This edition presents a radically improved text of Diogenes Laertius' Lives of Eminent Philosophers. The text is accompanied by a full critical apparatus on three levels. A lengthy introduction lists all the manuscripts of the Lives and discusses its transmission in late antiquity, the Middle Ages and the Renaissance. There is also an index of personal names, a bibliography and notes covering several features of the text and its interpretation. Professor Dorandi has used the Nachlass of Peter Von der Muhll, for the first time in its entirety, to verify and consolidate material that he had previously gathered. This is by far the most detailed and elaborate edition which Diogenes' Lives - a unique work which has had a profound influence on European literature and philosophy - has ever received. Introduction; Abbreviations and bibliography; Text (books 1-10); Sigla; Breviata; Svbsidivm interpretationis (books 1-10); Appendices; Index of proper names. Tiziano Dorandi is Directeur de recherche at the CNRS (Centre Jean Pepin, UPR 76) in Villejuif, France.